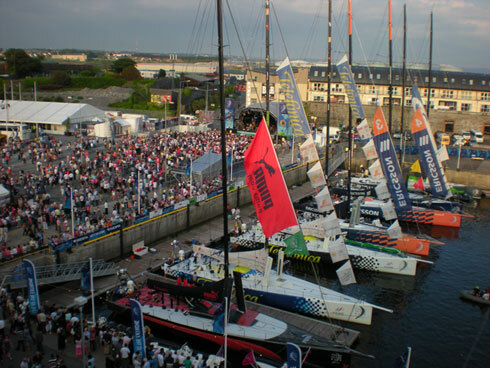 …A shot of the boats and relevant festivities taken from the top of Heinz carpark by the docks. This was taken about half an hour before Sharon Shannon came on stage so even though it looks like there were lots of people there, it is nothing compared to what it was like later. You can see the nose of the Irish/Chinese boat, Green Dragon, near the top of the picture. Take a better look at ‘the village’ here. The Village is where the oil tanks used to be. They knocked them down to make room for marina activities and from what I can tell, it’s been a huge success. Hopefully they will use it as a main point of focus for the Arts Festival in July. 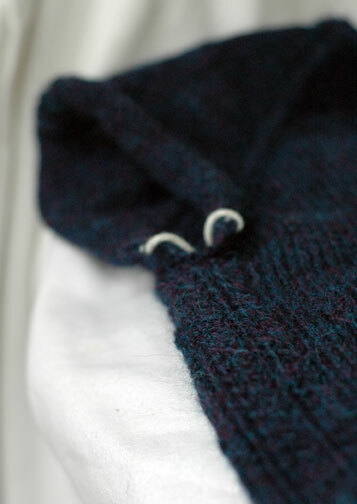 It wasn’t all boats yesterday… I knit some sleeve. Unfortunate but necessary. It will be three-quarter length, even though it doesn’t look it now, and I’m going to knit the sleeve cap flat and sew it in. 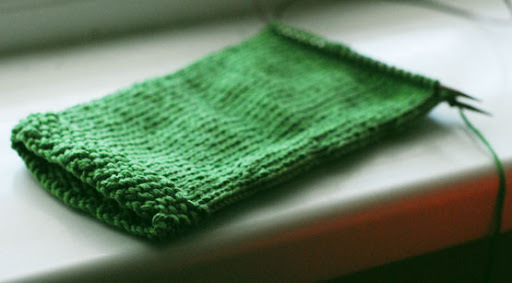 Honestly, the thought of the sleeve cap is the only thing keeping me going through the sleeve… which is a good thing because if I picked up stitches around the armholes and knit the sleeve cap, I would have absolutely no interest in knitting the rest of the sleeves! I think all there is in store today is a stroll on the prom… I think I have enough time to practice before Sleeping Beauty wakes up! Have a great sunny Sunday! The Volvo Ocean Race is in town until next weekend so Alb and I decided to make a long-overdue photo trip down to have a look at what’s going on. Neither of us know anything about boats – to us the racing boats just look like medium-sized yachts (although I am sure that to the trained eye they are very impressive). What we enjoyed more today was walking around the docks amind the throngs of people in to have a gander. 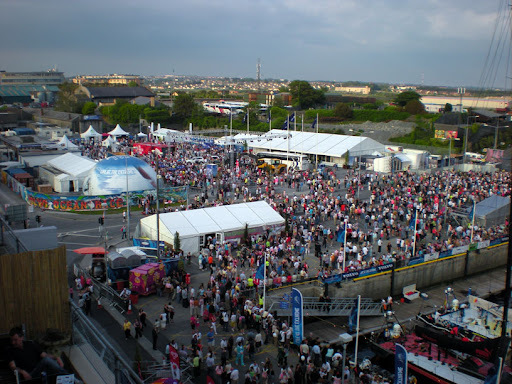 There is a great festival atmosphere around the place with music playing, plenty of various food and drink huts, a stage for nighttime entertainment… it’s all going on. Today, there is a ‘short’ race out in the bay. They all left at about 11am and won’t be back in until 7pm. At 1130, the Red Arrows flew by to perform and I think to get people out to Salthill to support the race. I have been lucky enough to see the Red Arrows here in Galway twice before and as always, they didn’t disappoint. Afterwards, we walked back through town. Lots of shops have decorated their displays with nautical themes… this was my favourite one! This was in the window of one of my favourite shops in Galway. It is a bakery beside Powells just off Shop Street. I think I have only been in it once, but I always make sure to walk by and check out their display: it is always so creative and cheerful. They regularly have big dishes of these guys out on display. Is there anything more yummy than meringue?! …and we walked through the weekend market and had some sushi from Wa Café. If you’re living in the Galway area, they do Japanese craft and sushi classes as well as great sushi. I have got knitting to show – I got started on my first green sleeve and I am nearly finished the body of Pioneer – but I’ll show you tomorrow. Think we’re off in a while to see the boats come back in so I think a cup of tea is in order. There has been a lot going on here, some good and some sad and some a mixture of both! 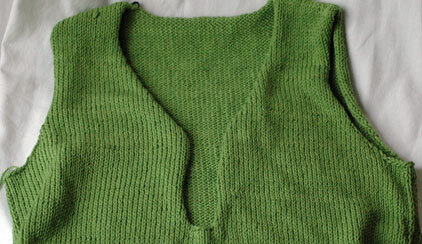 For now, let me show you how that green top has been coming along. I finished the body of it last night. Moss stitch hems always seem to suit cotton, I think. Don’t worry about the neckline for now. 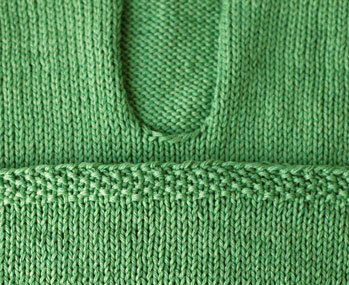 I am going to pick up and work a neckline that will overlap in the middle and button. I tried the whole thing on on Saturday night and I like the depth of the button band as well as how the waist shaping turned out. 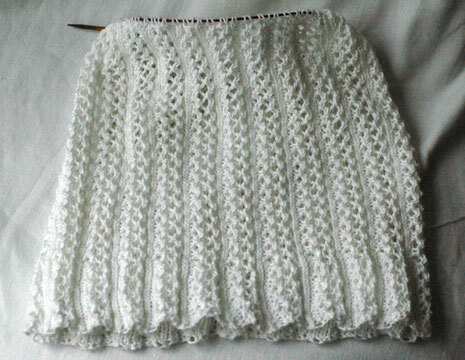 I just have to do the sleeves now – three-quarter lengths so hopefully they won’t be too torturous! The weather has been a bit up and down here recently so during those chilly evenings I have been working on Pioneer. The body is about half done from the underarm. Even though the Ultra Alpaca Lite is worked on the same needles and to the same tension as the green top, it is much slower going for some reason. It is probably the cables: there are tiny cables running down the centre back and along each side seam to make it fitted. I suppose it is a little strange to be making a wool and alpaca t-shirt for summer but I am one of those people who, unless it is 30 degrees, constantly feels chilly so I think I will actually get a lot of wear out of it! My sad/happy news is that I have left my job at the shop. As my piano commitments have increased over the year, so has the stress of working full time and trying to keep all balls in the air. I am happy with my decision to go back to the piano and to have clear goals in front of me. I have a lot of deadlines coming up this summer and it is great to finally have the time to give them my focussed attention. At the same time, I am sad to leave such a lovely little shop and to leave such a lovely staff! Still, it will be nice to go back to being a regular ole customer again. I forgot to add these guys in yesterday. I’ve been chipping away at Delphine from French Girl Knits since before Easter. It is a lovely, lovely pattern but very slow going. If it looks tiny to you, it sort of is. The lace pattern stretches out a million miles so I figure this will be a useful top – it will stretch over a blouse or long sleeved top maybe. 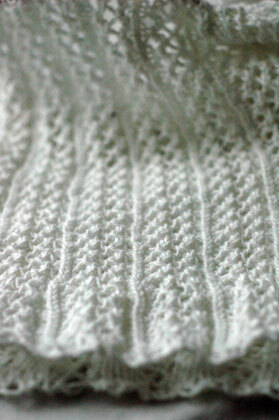 Here is a close up of the stitch pattern. It’s not nearly as complicated as it looks. In a fit of desperation for something challenging to knit, I decided to dig out Knitting New Scarves and jump into Linked Rib. It is a bit fiddly to get started but I really like the playing-with-lego feel to the pattern! 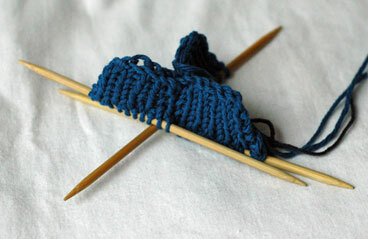 My knitting fizzled out there for a few weeks because… I suppose, the well of inspiration was running a little dry. Nothing like a really good colour to get things going again! This green in the Brown Sheep Cotton Fleece that came in just after I got back from Sligo really got me thinking. It is a top-down set in sleeve. It started out in my mind as a tshirt but I think I will make the sleeves three-quarter length. The gap in the front means I’m going to turn it into a henley – a fancy word for having buttons a little way down the front. 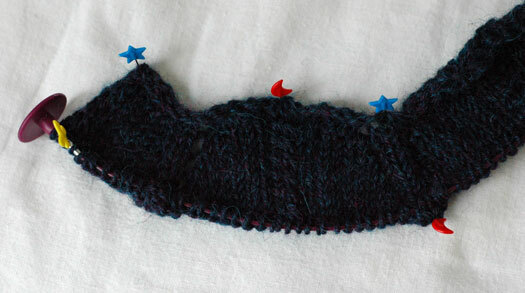 I’m going to rib all the way around the neck and have the parts at the front overlap and form a button band. 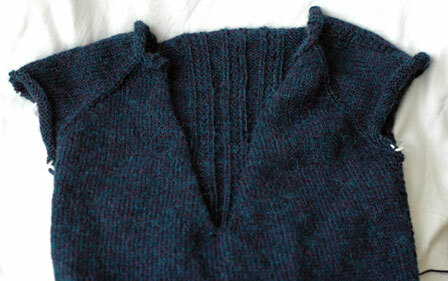 I am already at the waist so have been spending most of the time knitting this thinking about buttons and sleeves. I think cream buttons would be nice, don’t you? As for the sleeves, the more I think about them, the more I think I should knit them bottom up instead of picking up stitches around the arm hole. I love picking up stitches because it means no sewing and it gives such a seamless finish. But cotton isn’t very forgiving and I worry that the weight of the sleeve would show up little gaps in the sleeve cap where I picked up. Also, I have never figured out the numbers for working a set in sleeve cap before, so that’ll be something new. I started Pioneer from this Spring’s Knitty this morning. I have had six skeins of Berroco’s Ultra Alpaca Light sitting in my stash since I visited Heidi last July and was thrilled to finally find a pattern worth of such gorgeous stuff. In case you haven’t heard yet, the shop is moving out of Blackrock and expanding into bigger premises in the Powerscourt Centre over the June Bank Holiday weekend. You can read all about it over here on the shop blog. There are pros and cons to any situation, but I think the pros here are really good ones! Because of the location we’re going to be able to offer lots more midweek classes on top of the usual weekend classes… and we will be able to offer lots more of all the usual suspects as well as some new things, too. Exciting stuff, eh?